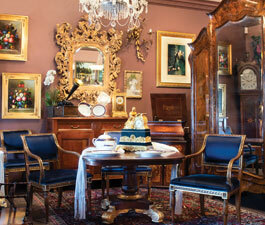 With over 40 years of experience selling to clients from around the world, Solvang Antiques is widely recognized as one of the country’s finest antique galleries. They feature exquisite antique, vintage and estate jewelry, and 18th and 19th century furniture showcased with an exceptional selection of restored antique clocks, watches and music boxes, decorative accessories, antique lighting and sterling silver. Our Spring Jewelry Sale is going on now! 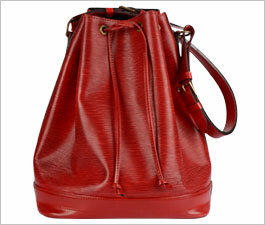 Save up to 70% on every piece of jewelry in the store, plus free domestic shipping. Stop by and see the latest Mary Kay West this Friday 11:30am-3pm. Click here to view all our jewelry categories. 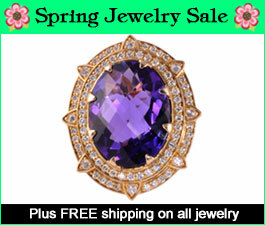 Shown above: Checkerboard Cut Amethyst & Diamond Cocktail Ring 70% off! 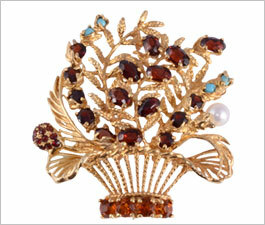 Vintage Lucien Piccard flower basket brooch or pendant, circa 1950. This 14 karat gold Lucien Piccard brooch or pendant features oval and round garnets, round citrines, four turquoise and a pearl. Learn more. 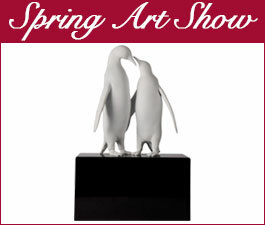 Our Spring Art Show is going on now! The new works by the gallery’s recognized and award-winning artists include oil paintings filled with the splendor of Spring along with sculptures of wood and bronze. Learn more. View all art in the show. 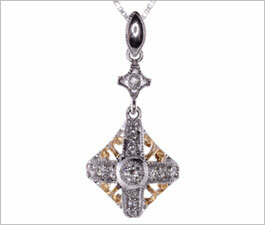 Vintage diamond pendant on white gold chain, circa 1940. This platinum, 18 karat white & yellow gold pendant features a .25 carat round brilliant diamond having SI1 clarity and H color, along with 13 accent diamonds. The pendant is marked by maker. Learn more. There's something for everyone at Solvang Antiques from the casual browser to the serious collector—from exquisite antique, vintage and estate jewelry to fine art paintings and sculpture, silver, porcelain, and cut glass along with collector items, fine furniture and museum-quality investment items. About Us.